Please pray for peace this weekend in Bolton as we are descended upon by the English Defence League as well as a counter protest by Unite Against Fascism, and lots and lots of police. 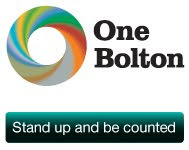 Let's hope that Bolton rejects divisive messages and continues it's strong interfaith work. Britain is second only to Iran in giving established religion so much power in the constitution. Twenty-six male Anglican bishops sit in the House of Lords (the second chamber) as a matter of right and vote on legislation. This gives a particular religious voice power as a matter of right rather than merit. This is clearly unacceptable, and most people in the country, and indeed most Christians in this country think so. I'm a supporter of Power2010, that has gathered five clear ideas (gathered from the grassroots) to reform British politics. One of these is to replace the House of Lords with an elected second chamber. The time for this is clearly overdue. I'd encourage you to write the Anglican bishops to ask them to support this democratic move. 50,000 people already have. It would be wonderful if the bishops could stand up for democracy and voluntarily give up their power for the sake of democracy - what a wonderfully powerful Christian witness that would be.